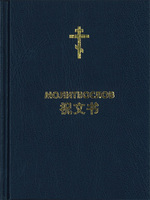 A hardcover bilingual Russian-Chinese prayer book is now being made available for the first time. The first run of 2000 copies has been printed in Moscow, Russia through the support of the Brotherhood of Sts Peter and Paul of Hong Kong. The prayer book consists of the morning and evening prayers and the Divine Liturgy of St John Chrysostom. 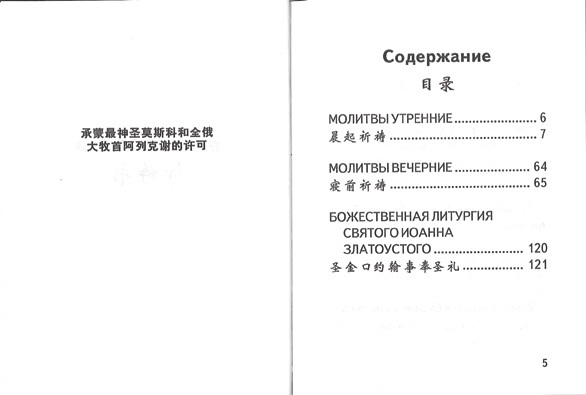 The Russian text flows on one page and the modern Chinese text in parallel on the opposite page. This new translation in modern Chinese follows the missionary zeal of Metropolitan INNOKENTY (Figurovsky) of Beijing who authorized a translation commission in the early 20th century to provide liturgical books in the local venacular such as the 1910 Chinese prayer book. St John (Maximovich) also blessed a revised edition of the prayer book with more catechetical material in 1948 for his Chinese flock while he was Archbishop of Shanghai. Following its predecessors, a new translation is once again made available in the venacular of today, balanced with dignified Chinese vocabulary suitable for devotional and liturgical use. This new translation has been dilligently compared with the original Greek and other English prayer books. The text of the psalms as used in the liturgy will eventually be revised to conform to the Greek Septuagint (LXX) and to be made available online initially for comment for accuracy and ease of use. Chinese Orthodox Christians living in Russia and mainland China may request a free copy of this bilingual prayer book from the Brotherhood. All others may request a copy with a freewill donation of any amount to help underwrite this missionary endeavor.